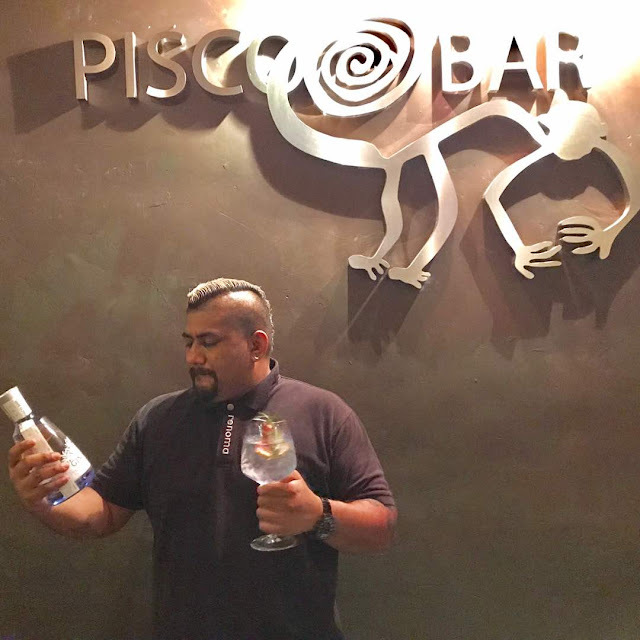 Pisco Bar is a well known Spanish Bar in Bukit Bintang District at Jalan Mesui Around the Famous night life area Changkat Kuala Lumpur . Exact located Opposite of Park Royal Serviced Suites Hotel Kuala Lumpur . You must walk near to identified The bar while the Signboard was kinda small from far , The Jungle look a like entrance catch my eye sight that looks like a mysterious Hidden bar behind of it . The Interior of Pisco bar was so unique . First we look up on the ceiling , Using recycle Wood Pallet fill full the top . Lighting In Pisco Bar is less but enough bright to see each other faces , the hanging bulb at the bar covered with steel bucket flash directly to bar table , Unique Rite??.. - Left wall hanging with black and white photos that I have no idea who are they . On the Right wall , Fill with everyone all time favourite imported alcohol bottles from all the place in every corner in the world . The Crowd Started coming in from Dinner hours and hang out till late night for drinks . One thing you need to know is Pisco bar Is not just a place for Whisky and coke combination or draft beers . At here in Pisco bar , They Serve delicious foods from appetizer to Main course and Snacks as accompanying while toasting your cups with your partners in crime . Some live music to spice up the night at Pisco Bar with Indigo & The Lights bringing the global sound Pure energy that started 9PM onward . She have the awesome smile and beautiful voices all night long , We really enjoy whatever song she sang and the crowd sing along that makes the place much more happening . Beside Foods and music , They have a good hand on Cocktail by serving patrons favourite Coocktail Mix Up . Fresh , raw fish , Fillet & Squid marinated in lime juice , topping with onions and chili peppers . The platter have deep fried baby squids , Pisco Parmigiana sliced aubergine , layered with cheese and tomato sauce , Croquetas , grilled beef skewer and Chorizo lollipop . a simple dish with great flavours and textures . the combination with lime , tomatoes and capers made the meat really delicious . The mixed is made not only with different types of meat, but also with different seafood such as mussels, small cuttlefish and prawns . It was moist and light on the inside with a crispy exterior coated in cinnamon and sugar . Salted coconut espresso Martini , Nice and Sole , Pisco Spice , Chili passion martini and Gin Mare Twist .